I grew up in a meat-and-potato family. No fish. Not even tuna sandwiches. The closest would have been the fish sticks and tater tots a handful of times during my childhood. In high school I became a vegetarian, which lasted up until I met my husband who fed me a steak so delicious it changed my ways pretty quickly (when I called to tell my Mom that I'd eaten beef, she hung up, turned to my Dad, and declared that I'd met the man I would marry!). The first time I had "real fish" was when I was twenty years old, visiting my then-fiance while he was on tour in Chicago, at an Easter brunch. It was a tiny piece of salmon, and it was delicious. That doesn't mean I jumped into the pool with all the fish lovers out there. Old habits die hard, and Mike himself is a very meat-and-potato type of guy. But with our kids on the other hand, I've tried to let them explore the culinary world far more than I was ever able to in my own childhood. It helps that we've lived in a couple of foreign countries where even places like McD's doesn't serve the same food you would find here in the U.S. When going out with our foreign friends, we let them order and most of the time we simply did not ask what we were being fed... it was easier to just enjoy with an open mind and open mouth. I cannot stand children who are picky eaters (that is putting it mildly). With my kids I am very strict about them eating what is served. If I cook it and we serve it, then you eat it or else you eat nothing. I let them choose the amount that will go on their plate, never forcing them to eat what I think is the proper amount, but if they put it on their plate, they better eat it. I've never cooked one meal for the adults and one meal for the kids. Heck, I barely cook one meal at all! And I've tried cooking all sorts of crazy things! As a result, they are always willing to try anything you put in front of them, or, as they have both found out, willing to go to bed hungry. This week we were treated to dinner at my friend Nichole's family restaurant, Captain Kidd's Fish Market, in Redondo Beach. We went in and got to choose the piece of fish we wanted and how we wanted it cooked. 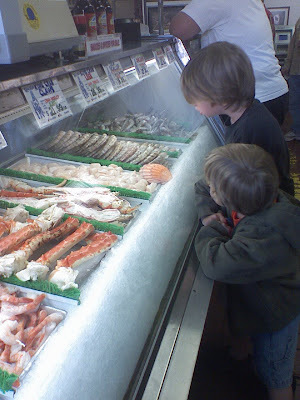 Mike and I went pretty safe with salmon, while the boys ran around the cases and picked out king shrimp, popcorn shrimp, and clams. It was all delicious and the boys devoured every last bite of food on the table, even what Mike and I were too stuffed to finish. On the ride home they could not stop talking about how great it was. I'd say there is hope that these two boys will not be meat-and-potato guys as they grow up!